The National Science Foundation website says "...Researchers have found that bricks made from fly ash--fine ash particles captured as waste by coal-fired power plants--may be even safer than predicted. Instead of leaching minute amounts of mercury as some researchers had predicted,the bricks apparently do the reverse, pulling minute amounts of the toxic metal out of ambient air. Each year, roughly 25 million tons of fly ash from coal-fired power plants are recycled, generally as additives in building materials such as concrete, but 45 million tons go to waste. Fly ash bricks both find a use for some of that waste and counter the environmental impact from the manufacture of standard bricks. "Manufacturing clay brick requires kilns fired to high temperatures," said Henry Liu, a longtime National Science Foundation(NSF) awardee and the president of Freight Pipeline Company (FPC), which developed the bricks. "That wastes energy, pollutes air and generates greenhouse gases that contribute to global warming. In contrast, fly ash bricks are manufactured at room temperature. They conserve energy, cost less to manufacture,and don't contribute to air pollution or global warming." 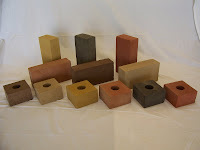 Once colored and shaped, the FPC bricks are similar to their clay counterparts, both in appearance and in meeting or exceeding construction-material standards. due to weather. Liu is now working from a second-phase SBIR award to test the brick material's safety and prepare it for market. "Green manufacturing is a focus for the nation," said Tom Allnutt of NSF's SBIR program, who oversaw Liu's award. "Liu's innovative use of fly ash to manufacture high quality building materials will potentially decrease some of the negative environmental impact of coal-fired power generation while meeting increasing demands for greener building materials." While researchers need to study the bricks further to determine how the mercury adsorption occurs and how tightly the metal is trapped, the new findings suggest the bricks will not have a negative impact on indoor air quality. On average, air contains low amounts of mercury that can range from less than 1 nanogram per cubic meter (ng/m3) to tens of ng/m3--a small fraction of the Environmental Protection Agency limit for continuous exposure. Inside a confined experimental chamber, the bricks did not raise the mercury levels in the surrounding air (originally more than one nanogram), and instead appeared to lower the concentration down to roughly half a nanogram. Engineers from FPC of Columbia, Mo., developed the bricks with NSF support and reported their findings on mercury leaching at the May 7-10, 2007, World of Coal Ash Conference in Cincinnati, Ohio. University of Missouri-Columbia in 1991 to research and develop capsule pipeline technology..."
Quirks and Quarks says "...Most people agree that a major problem facing our planet today is the rising level of greenhouse gasses in the atmosphere. So environmentalism has now become mainstream, with recycling, fuel efficiency, and reduced use of plastic all part of our daily lives. But one area that still needs dramatic improvement is the construction and design of the buildings we live and work in. It's estimated that forty percent of our greenhouse gas emissions in North America come from our homes and offices. So researchers and builders are looking for ways to 'green up' our homes. But the really large changes are going to come with new home construction. While many homes outside urban areas are getting larger and larger, Andy Thomson, a Toronto architect with Sustainable Design, is moving in the opposite direction. He's designing homes that are less than 300 square feet in size. 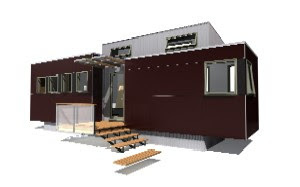 Based on trailer homes, he's using the latest in materials and design to create family dwellings that produce their own electricity, and are so efficient, they can be completely heated and cooled using barbeque tanks of propane. But not everyone's going to be willing to move into such a small domicile. Instead, it may take development of new materials to improve home construction. One of these is a wood product developed by Michael Sykes, the creator of the Enertia home. He's discovered that the resin in pine wood crystallizes at room temperature, and is exploiting this in the creation of homes that don't require a furnace to heat. Instead, the wooden walls absorb heat from the sun during the day, and release it at night.A big change that needs to happen if we're going to create green communities, is to change the actual design of our living environments. Both the homes themselves, and the makeup of the communities we live in. Amanda Mitchell, from the University of British Columbia, is part of a team that works with developers to come up with environmentally friendly community designs..."
The ApproVideo website is "... a new Video wiki/blog site developed by the Engineering for Developing Communities Program (EDC) at the University of Colorado and PlanetMind. This site provides a collection of already published short videos illustrating a wide range of sustainable and appropriate solutions for developing (and developed) communities worldwide. You will find innovative ideas, tools, cutting edge programs,case studies, and initiatives in the areas of education, health, energy, water, sanitation, etc..."